Powerpop/garage nobility with quite possibly the who-the-hell-are-they-and why didn’t I know-about-them album re-release of the year! Louder Than War’s Joe Whyte reviews The Split Squad’s first offering. This album arrived with little fuss with a bunch of others from our pals at Closer Records in France. Anyone who reads LTW will probably have heard of the label; they specialize in scuzzy garage and bespoke psych releases for the most part and the standard and quality of the stuff that they truck in is ridiculously high. I have to be honest, I’d never heard of The Split Squad before and the sleeve with it’s rather classy artwork gave little clue to what lay within. I was driving home, it was Glasgow in February; dark, dank and rainy. I stuck the CD into the player in the car and was immediately transported to a sunnier place. Bursting from the tinny little speakers was an explosion of righteous goodness; chiming guitars, three-part vocal harmonies, a Spector-esque drum sound and a vivacious energy and bubblegum fizz that was several parts California sun and and half a dozen parts Detroit garage. The opening title track sets the scene perfectly. Syncopated guitars chop across both channels as explosive drums enter the fray (at this point I should have guessed at least one of the players involved) and a luscious vocal hook attacks the synapses. Jumping ahead a bit, a quick perusal of the internet tells me that yup, on the traps is none other than Clem Burke of Blondie fame. Even better, it seems that his team-mates are Keith Streng from The Fleshtones, Eddie Munoz from The Plimsouls, Michael Giblin from The Parallax Project and Josh Kantor who’s in The Baseball Project. Taking their name from their beloved baseball (it’s a term used to describe A and B teams playing each other in close season) they’ve decided to form a group that puts together all of their influences and talents. To add to that, lets face it, more than decent line-up, a few other well-reknowned faces make an appearance. Step forward Peter Buck (R.E.M. ), Scott McCaughey (R.E.M. and Minus 5), Hugo Burnham (Gang of Four), and Mike Gent (The Figgs). Originally out in 2013 as a download only, it was quietly released last year on CD before this full, all-format release. If you’re a fan of The Flamin’ Groovies, Big Star, Nuggets– era garage, The Posies or The Raspberries, I urge you to get all over this album right now. With songs written by Giblin (and co-written with his compadres) sitting side by side with cover versions of (among others) “Sorry She’s Mine” by the Small Faces, “Now Hear This” is a thrill-ride from start to finish. It’s rare to hear an album these days that is as complete as this one. The bands press on the website kind of plays it as a knockabout bit of fun and while that’s true, it’s also much more. Giblin’s songs have the DNA strands of classic pop and rock woven large through their sparkling construction; “She Is Everything” sounds like something that has been mislaid from a list of the greatest powerpop songs ever recorded and has that creepy familiarity of all of the classics. I actually was reminded of the Bay City Rollers and other 70’s pop/glamsters as the drumming has that whole “”Shang-a-lang” drum stomp through it. No bad thing. As I’ve mentioned, there’s not a duff track on the album. I particularly liked the soul-dripping “You’ll Never Change” which was originally a hit for Betty Lavette. It is a tad different from the rest of the life-affirming songs on “Now Hear This”, being a little more laid back. Again, it sits perfectly with the originals. The absolute central track, however, is Giblin’s “Feel the Same About You,” which takes all of the ingredients from 70’s power pop—chiming, ascending guitars, sweetly melded vocals and a bittersweet harmony over Burke’s eye-popping drumming and creates a song that wouldn’t sound out of place on 70’s radio at all. Grab a beer, go get your best girl and get down to The Split Squad. You heard it here (kinda) first. 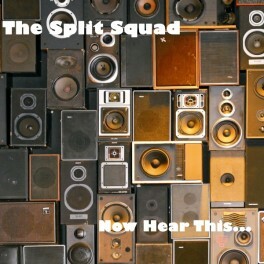 The Split Squad’s official website is: www.thesplitsquad.com. They can also be found on Facebook. Words by Joe Whyte. You can read more of Joe’s writing at his Louder Than War’s authors archive.